WISHLIST owned by Viv Motbey has had an outstanding start to his career. 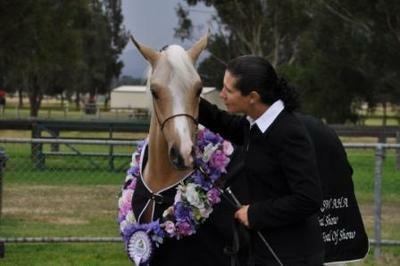 A Yearling Palomino Colt, WISHLIST, at the NSW WPCS All Breeds Foal Show, was awarded Supreme Arabian Derivative and Supreme Coloured Exhibit. The next week at the AHA All Breeds Foal Show he was awarded Champion Coloured Exhibit and Champion Arabian Derivative Exhibit. He then went on to be named Supreme Foal of Show. We are very excited about this beautiful colts future. Congratulations Viv. Lovely colt and looks set for a great future. Thanks for taking the time to post your brag on here.